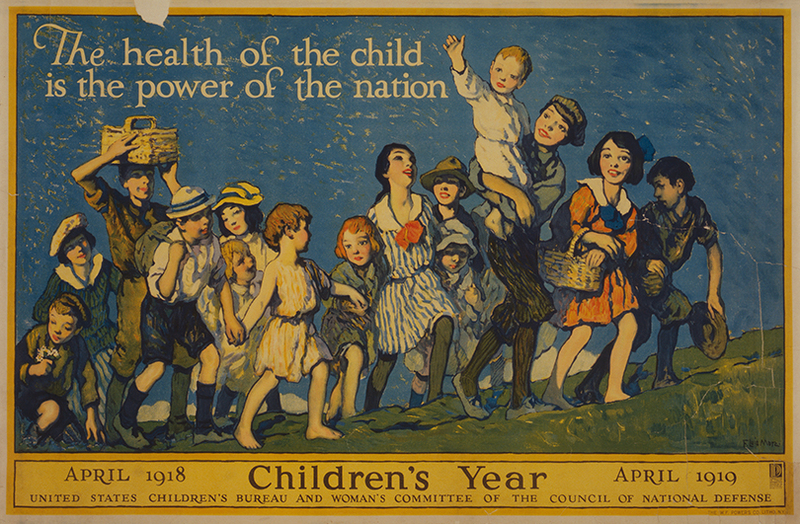 "The health of the child is the power of the nation"
The early 1900’s was a time when social reformers were attempting to abolish abusive child labor practices and enact state legislation prohibiting factories and farmers employing very young children at very low wages. Some child welfare advocates recognized that the federal government was not yet fully engaged in addressing the physical or mental well-being needs of children. Their efforts eventually resulted in creation of the U.S. Children’s Bureau in 1912. The entries below reflect much of the history and several of the agency’s early administrators. Children's Aid Society of PennsylvaniaWritten by Michael Barga. The Children’s Aid Society of Pennsylvania (CAS of PA) was formed in 1882 and was one of the first organizations dedicated to the care of children. The organization’s work has combined policy and direct service over the years, and the Society’s responsiveness to communal needs is especially highlighted through their efforts in times of war, depression, and social discord. Children's Bureau: Part IWritten by Dorothy E. Bradbury, Assistant Director, Division of Reports Children's Bureau. "Thisis the story of the Children's Bureau of the U. S. Department of Health, Education, and Welfare from the idea in 1903 to its founding in 1912 and on through the years to the present time." Children's Bureau: Part IIWritten by: Dorothy E. Bradbury, Assistant Director, Division of Reports Children’s Bureau. "In getting underway–and in carrying out the three children’s pro-grams for which it was given responsibility under the Social Security Act–the Bureau in characteristic fashion turned to advisory groups for advice and guidance. Advisory groups were immediately set up for each of the programs. For the most part, these were professional people concerned with the technical aspects of the program." Children’s BureauWritten by Kriste Lindenmeyer, Ph.D., Professor of History, University of Maryland, Baltimore County. The establishment of the U.S. Children’s Bureau in 1912 marked a high point in the effort by many Americans to improve the lives of children. Progress Report on Maternal and Child-Health Services: 1940Progress report on maternal and child-health services by Edwin F. Daily, including recommendations and 15 month assessment of the Children's Bureau. Recommendations of the Advisory Committee on Maternal and Child Health Services: 1938Recommendations regarding the selection, training and compensation of personnel, cooperation with other agencies, and hospital standards.